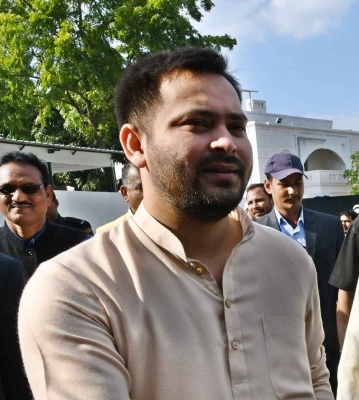 New Delhi Sep 15 (IANS) RJD leader and former Bihar Deputy Chief Minister Tejashwi Yadav on Saturday said that the BJP would not get a majority to return to power in the 2019 Lok Sabha elections as it would lose around 100 out of the 134 parliamentary seats in Bihar Jharkhand and Uttar Pradesh. "Today the BJP has over 115 seats in Jharkhand Bihar and Uttar Pradesh. But in 2019 the BJP would lose around 100 seats in these states due to the kind of alliances that are coming up " he said at the India Today "Mind Rocks Youth Summit 2018". "There is no doubt in that the BJP won t get majority and they are going to lose " the Rashtriya Janata Dal (RJD) leader said. He said that in Uttar Pradesh due to the alliance between the Bahujan Samaj Party and the Samajwadi Party the Chief Minister (Yogi Adityanath) lost his seat of Gorakhpur in the by-polls early this year. "The kind of situation that is there in Bihar and the kind of alliance that is coming up in Jharkhand the BJP would face losses in these states " he said. There are 80 Lok Sabha seats from UP 40 from Bihar and 14 from Jharkhand. The BJP had won 73 seats from UP in the 2014 general elections along with its alliance partner Apna Dal. When asked if in such a case there would be three Prime Ministerial candidates from the opposition Yadav questioned "Did any of the leaders in the opposition claim to be the Prime Ministerial candidate?" "In 2019 Nitish Kumar won t win anything. Today also he is a Chief Minister through the back door as he broke the grand alliance that was forged in the state ahead of the 2015 assembly polls. And look today who is in power in Bihar it is BJP " he said. Nitish Kumar had broken the Janata Dal-United party s alliance with the RJD and the Congress in the state in July last year and went back to its old ally Bharatiya Janata Party (BJP) in the state. Highlighting the deteriorating law and order condition in the state the RJD leader said "Look at the condition of law and order in Bihar. When minors were raped the Chief Minister remained quiet because his party leaders were involved in that. And then I have to come to Jantar Mantar to protest against the rapes. And till today nothing happened in the case. Even the CBI and the ED who are after us did nothing in the case " he claimed. Referring to the Central Bureau of Investigation (CBI) and Enforcement Directorate (ED) action against his family members Yadav said "They claim when I was a teenager and not even having a moustache I was doing a conspiracy in the Railway Ministry. How is it possible? I was in school and I was playing cricket. "My entire family is being investigated. But why action only against only one family? To pressure us they are doing their best " he alleged. "But no investigation against Jay Shah why because he is the son of BJP chief Amit Shah " he added.